On 9th April, Ned and UMN team scheduled a second field trip for the e-waste topic. Since unfamiliar with e-waste industries at the very beginning, we have done the preparation with not so wise strategies. When I got contacted with one proposed observation spot, a metal waste treatment park, I asked directly about e-waste recycling treatment, and the park personnel denied immediately and explained that it’s because e-waste is illegal to import and the park is mainly dealing with the imported metal waste, so they don’t do e-waste at all. I followed a question of what exactly metal waste in the park. They range from discarded steel and copper to other semi-deconstructed metal waste, for example, some wasteful part of cars or an electrical motor from huge equipment. In fact, it’s hard to distinguish electronic waste from others. The personnel also admitted that sometimes their shipments may have some e-waste inside, but there is pretty small part otherwise custom would detect and forfeit the whole shipment. The final question is asked about that if those waste are not completely de-constructed and then how they deal with them. The personnel confirmed only manual redistribution by workers for current stage. With this telephone interview, as we were informed no e-waste spot could be available to visit, we gave up the original proposal. However, in the class discussion later on, our team member Angela provided some important information from her friend who works in the park confirming that there are some factories doing e-waste treatment informally. The final field trip was to visit some second-hand electronic product (e-product) markets. 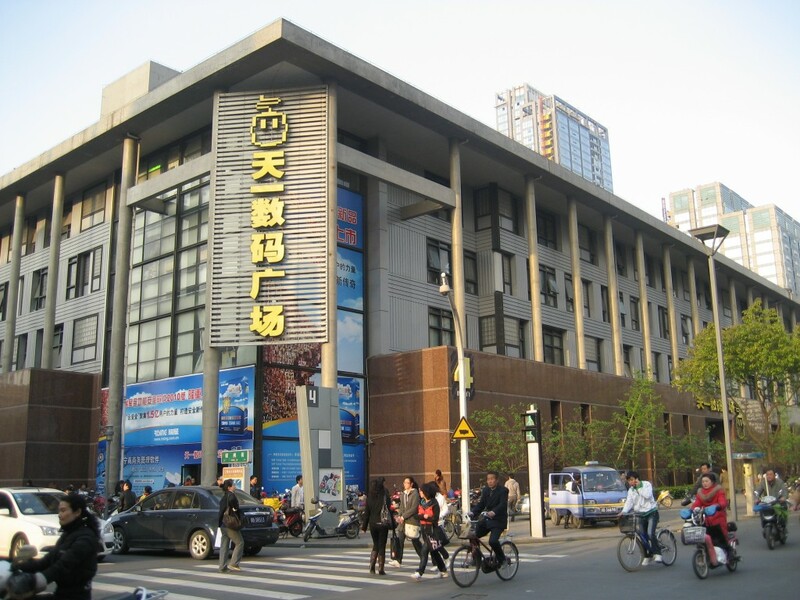 In the morning, we firstly visited Tianyi Digital Plaza and then YiGao Digital Plaza. Both sell brand-new e-products, repair the broken, purchase the old and resell the second-hand. When we visited the floor especially bearing upon old e-products, we randomly interviewed some shop owners while not so many of them willing to answer our questions. We learned that currently the old product sources are mainly from domestic, and just a few from the foreign countries which is less and less because of the channel to get them is illegal (the same reason mentioned by the personnel from waste park). We also found even in a small market, there exist some business chains. For example, some only repair the chip-boards for second-hand e-product shops. After team lunch, Mukda, Yulin and I visited South Gate Market, the biggest old product market in Ningbo. We could see a lot of old products sold or discarded by their previous users redistribute there, some lots of crashed televisions, some for air conditioners. We tried to search second-hand e-product shops, but, quite rare could be found before we jumped in the one introduced by a friend who had experience buying old stuffs here. Afterwards we understood that the declining number of second-hand e-product shops is because of less profit margin squeezed by decreased prices of new e-products and less customers. We chatted with staffs there and watched them working on the site. They introduced that after collecting back some old products, the first step is to de-construct each part and test performance. If any part is broken, they will try to repair or get a replacement. Then, it will be cleaned and reassembled to a well-functioned one for customer selection. 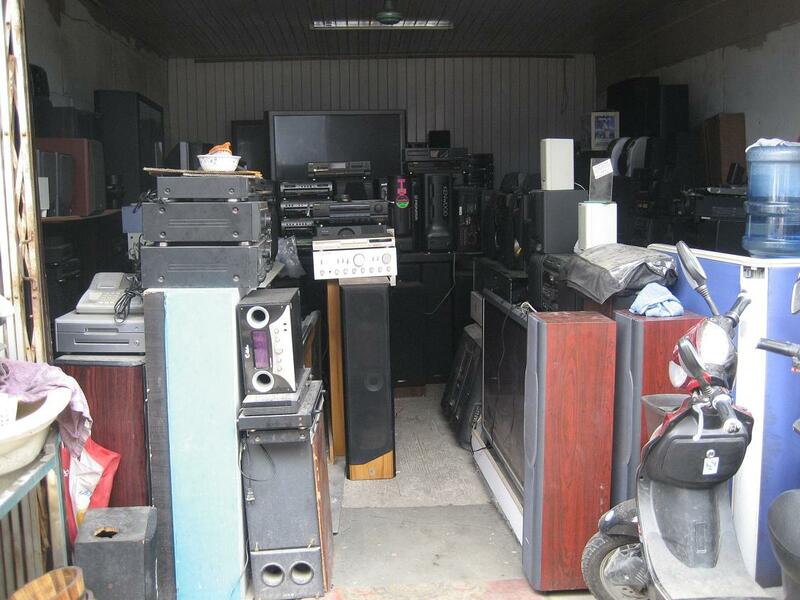 Regarding those useless parts or unsold e-products, they consider them as absolute e-waste and move them out. Some junk man from Guangdong province or TaiZhou district would come and collect them. These e-wastes are sold per kilogram, and the prices are quite regularly fluctuated and mostly decided by raw material market. When transported to the following destination, these e-wastes will be crashed down in order to extract metal materials. During this field, we found two different characters practically bound with these old e-products: e-waste and secondary resource. Regards with the industries chain or network, it might be the end of a chain as so called e-waste; on the other hand, it is the starting point as the secondary resource of a new industry chain. 1. Below are a few pictures of the field work. An interesting video metaphorizing the potential destructive power of e-waste. I totally agree with your conclusion that e-waste could the the end of the a product life cycle, but it could also be a starting point of a secondary resource of a new industry chain. Each country should be responsible for their own e-waste and they should be more concern about the future environmental issues. Therefore, materials of e-waste has to be recycled and people should managed recycling process efficiently so that materials are use at the optimum level. This will reduce the amount of unwanted e-waste in many countries.